For a great fisking of Yoo's claim that there's no legal basis for defining torture, head over to Looking for Someone to Lie To's post, Yoo can't be serious. For the latest torture memos, look to the UK. In defiance of a gag order, the former British ambassador to Uzbekistan, Craig Murray, has released memos that are being described as revealing US/UK collaboration to condone torture. I'll read and analyze these in the near future, but you can read them for yourself at this Craig Murray blog. Telegrams.pdf: A series of telegrams that Craig sent to the Foreign Office, outlining his growing concern and disgust at our use of intelligence passed to the UK by the Uzbek security services. 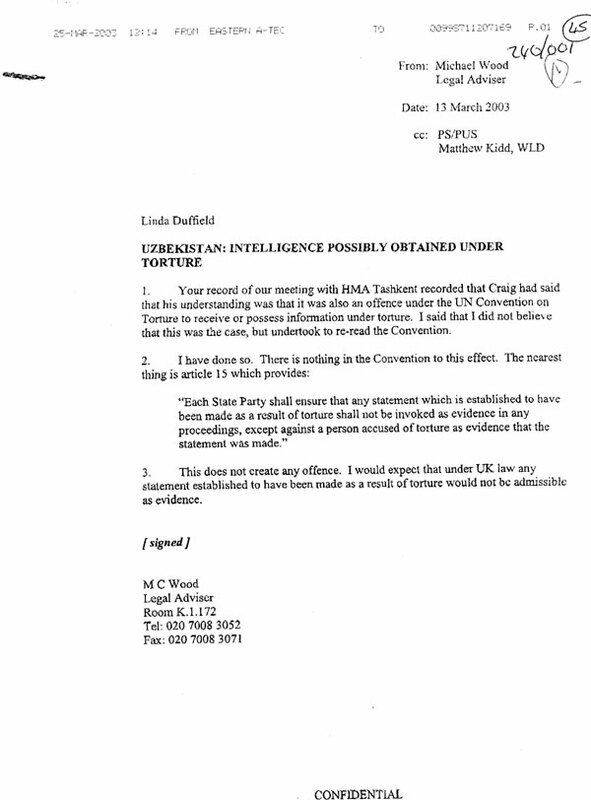 Legal Advice.jpg: A copy of legal advice the Foreign Office sought, to see if they were operating within the Law in accepting torture intelligence, and according to Michael Wood the FCO legal adviser; it is fine, as long as it is not used as evidence. UPDATE: Check out this Crooks and Liars audio of John Yoo explaining just how far he believes the president can go - torturing children.